It’s been nearly three years since I’ve seen my friend who the Germans call ‘Trouser’ so when we planned a catch up dinner out then tasty teas at mine I was mightily embarrassed by the state of my bedroom and did a quick clean up. The upside of letting your room become a disaster zone is you get to crawl into bed earlier. The downside is you can’t find anything you want the next morning while you’re rushing to get to work. Every time I clean I tell myself I’ll never let it get this messy again. Now I have found a reason to live in a pig sty. 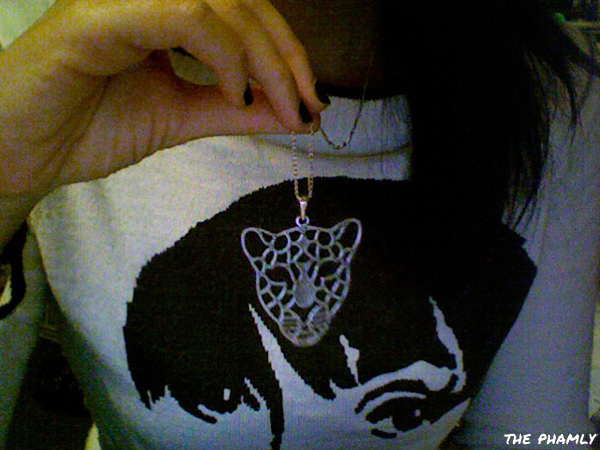 In my pre-Trouser clean up, I came across a cougar head necklace I had completely forgotten I’d bought two months ago! Yippee! I should be concerned about my whoppingly bad memory but, um, what was I talking about? Oh, the necklace – yeah, check it out! Bought online from Dragonfly By Emma.